Khemosabi++++// at his 30th Birthday Party. Photo courtesy Diane Dempsey. Doing a Khemosabi++++// retrospective is like visiting a special friend that no matter how many years it's been since you last saw one another, you fall right back into step as though you'd never been parted. However, calendars don't lie and they're telling me it's been a decade since Khemo cast his last knowing eye on a favorite grey mare. Despite being officially gone, this great stallion has been influencing the growing sport horse movement through his offspring and grand-offspring. Here at the Sport Horse Nationals Payback Program, we're lucky to have some of the finest concentration of Khemosabi sons and grandsons available anywhere. In alphabetical order they are: HS Kolors Khemorada, Khakhem Sahib+/, Khartoon Khlassic, Khemander Kody+/, Khomputer, Kornerstone KpM, Kruise+//, Rhocky Rhoad, and Soleil CA. Besides carrying Khemosabi blood, these stallions all have several things in common. They have excellent temperaments that lend themselves to amateur owners, the versatility to do well in multiple events, and the conformation and beauty that remains intact through decades. They also possess that Khemo charisma which might also be called "magic," or perhaps it's simply the wisdom that shines through their eyes. These stallion owners (and in one case, manager) all generously shared information, stories, and pictures that illustrate why Khemosabi lines remain so in demand among knowledgeable owners and breeders. Glossy ads don't tell the stories; the horses do through the lives they touch. We invite you to learn more by reading each of these stallions' stories. Julie Klug of PowderHorn Creek is the proud owner of Kakhem Sahib+/ (Khemosabi++++// x Allah-Rakhi), known affectionately as "Khemo" around home. A lifelong fan of Khemosabi++++//, she shared what she feels makes his khids so special. "Khemo horses have so much heart. It's hard to beat Khemo's heart and 'want to.' He was definitely the 'people's horse,' and he gave that back." 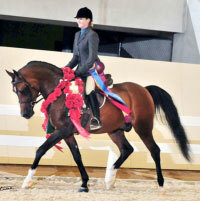 Kakhem Sahib is a three-time Reserve National Champion with numerous Top Tens. 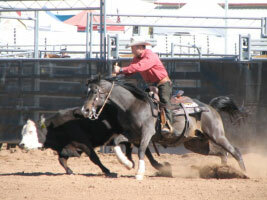 He's produced National Champions in Working Cow and Cutting and regional champions in Working Cow, Cutting, Hunter, Halter, Western Pleasure, Dressage and Endurance. How's that for diversity? ...see more. Marla Melloway and Kelly Damaj have a special Khemosabi++++// son of their own, Khartoon Khlassic (Khemosabi++++// x Fantasstic). 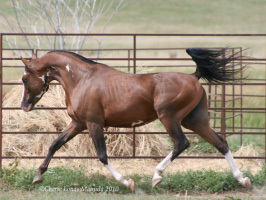 Marla notes, "Despite a kick in the front leg as a two month old colt, resulting in a compound fracture, he has proven himself to be a very successful breeding stallion." Cutting may not be the first event you think of when you have an Arabian, but Khemander Kody+/ (Khemosabi++++// x Hia Sehr) and owner Diane Dempsey make it look like a natural fit. 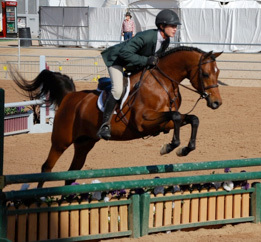 With five National Championships, one Reserve National Championship, numerous Top Tens, Regionals, and two IACHA World Open Cutting Championships wins, it's no wonder he is the top lifetime earner of any Arabian cutting horse with $47,026. So how did this amazing achievement come about? Khomputer (Khemosabi++++// x Zaza Kaborr) was purchased sight unseen as a two-year old in 1993, and used privately for fourteen years on his former owners' ranch. In 2007, his new owners Ken and Connie Walling made this handsome Khemosabi son available at public stud, giving mare owners a rare opportunity. Anyone who has lived in Southern California for any time has probably seen a picture of Karen Malcor-Chapman's Khornerstone KpM (Khemosabi++++// x Shahntu), known as "Beau" to his friends, in the house watching TV. How did this come about? Karen explained, "Someone bet me that there were no more 'live in your tent' Arabians any more. 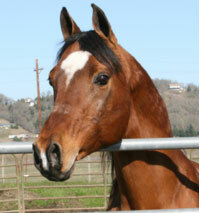 So I brought my (at that time) 3 year old stallion Beau into the house." Owned by Brenda Thompsons, and ridden to Regional-level wins by Brenda and daughter Rebecca, Kruise+// (Desperado V x Kherida by Khemosabi++++//) is one special horse. Stallion manager, trainer, and owner of several Kruise foals, Robin Ginn was able to share Kruise's story with us. Named for a famous ice cream, Rhocky Rhoad (Khartoon Khlassic x PC Padrona Bey) will melt your heart, just like he did for owner Cherie Lonas Mamula. "Rhocky Rhoad is a Khemosabi++++// grandson with the expression that I have only seen in great Khemosabi offspring. Big, kind eyes and gentle nature along with stunning conformation has been the 'common denominator' that I have seen in Khemosabi decedents." Now that you've seen the incredible Khemosabi sons and grandsons the SHN Payback Program has to offer, make sure to consider them carefully as options for your special mares. 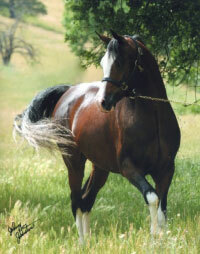 The "All American" Khemosabi lines have proven they cross well onto any mare's pedigree. Also be aware of the fact when a SHN breeding sells out, there will not be another opportunity that year to buy it for that stallion. So if you're interested in one of these stallions, please don't delay—for some of them, it's already too late for 2011. 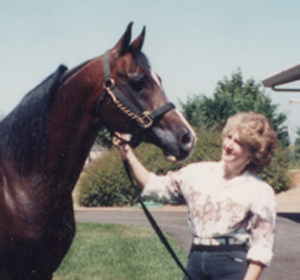 Diane with Khemosabi in the 1990s. Photo courtesy Diane Dempsey. In these trying economic times, it's more important than ever for mare owners to consider carefully their breeding plans. Very few of us want a horse suitable for just one thing. 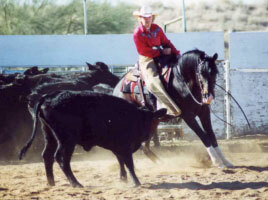 Even less of us want a horse with a difficult temperament. Perhaps that is why Khemosabi's legacy has been so enduring. 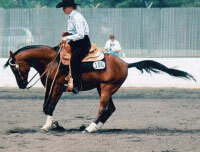 His line offers versatility, beauty, longevity, intelligence, and the type of personality and temperament that creates a life-long bond between horse and human. 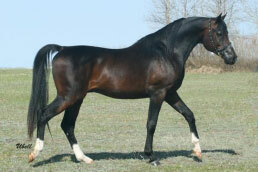 What else could you expect of an Arabian line named for a "faithful friend?" While this article is focused on Khemosabi and some of his wonderful offspring, we were sad to learn that Dr. Bert Husband passed away last month. Along with his wife Ruth, they not only bred this magnificent stallion, but also championed him from birth in the belief he was something special. Julie Klug, owner of the Khemosabi son, Kakhem Sahib+/, said it best about Bert, "He was truly the 'passion' and heart behind Khemosabi. 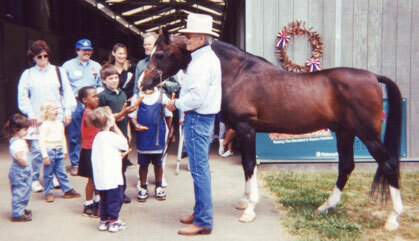 He loved that horse." Our condolences go to Ruth, Paul, and the entire Husband family.